Skål International New Zealand is part of a global professional organisation of tourism and travel leaders and has five clubs spread throughout New Zealand in Wellington, Auckland, Christchurch, Rotorua and Queenstown. Debbie provided an informative and entertaining presentation about the New Zealand cruise industry and New Zealand Cruise Association, which was warmly received by the large number attending. The industry voice leading the New Zealand cruise industry to ensure it remains a cohesive, sustainably viable sector within the New Zealand Tourism Economy. Infrastructure – basic – longer wharfs, competition for wharf space. Itinerary development – need new ports to keep the repeat visits.A lack of understanding regarding this industry from within NZ requires constant advocacy work from NZCA. Remaining a competitive destination – NZ faces competition from the Pacific, Papua New Guinea, Asia and Australia. Making sure cruise line business interests are best served, they are not a charity they are a business. Ships are getting larger, more are being built. Australia’s double-digit growth as source market. Most NZ Ports are investing heavily in cruise. Most NZ communities are behind cruise, friendly and welcoming. New Zealand is port rich and we have great product to sell. Cruisers often become land-based visitors. 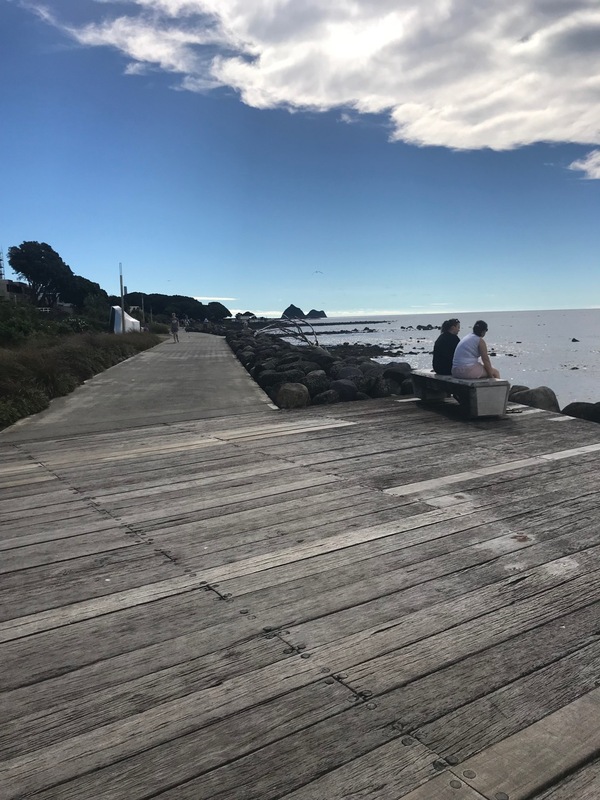 In mid-February ISS-McKay National Cruise Manager (and NZCA Board member) Doug Colaco, and Chief Executive Kevin O’Sullivan, went to New Plymouth to check out the port infrastructure and local attractions. We were picked up from the airport by Port Taranaki’s Customer Relationship Manager, Chris Dillon, and then straight down to the port to be kitted out for a run on the pilot launch to see for ourselves the approach to Port Taranaki. We were also able to discuss the operating systems in place for berthing cruise ships with the duty pilot. Vicki Fairley from Venture Taranaki joined us and we were able to take in many of the great attractions that New Plymouth, and the region, is famous for, including the 13km New Plymouth Coastal Walkway, Te Rewa Rewa Bridge, Pukekura Park and the Bowl of Brooklands. We even managed to visit the visitor centre at Mount Taranaki, which is only a half hour from the city. A stunning attraction in New Plymouth is the Len Lye Centre which houses the collection of Christchurch born Len Lye, one of the most original artists of the twentieth century, a pioneer filmmaker, sculptor, painter and poet. We were very fortunate to spend time at the centre with several of the guides showing us some of the wonderful exhibits. Thank you to Chris and Vicki for a very productive day in New Plymouth. Kaikoura was buzzing on the day of the seminar with tourists eager for the full Whale Watch and Dolphin Encounter experience. The Cruise Seminar at Dolphin Encounters’ office and café, was well attended too with speakers from Christchurch Airport, Tourism New Zealand and Service IQ. Kevin O’Sullivan gave a presentation on the current and future cruise benefits for Kaikoura and nationally (ably assisted by Caroline Blanchfield from Christchurch). 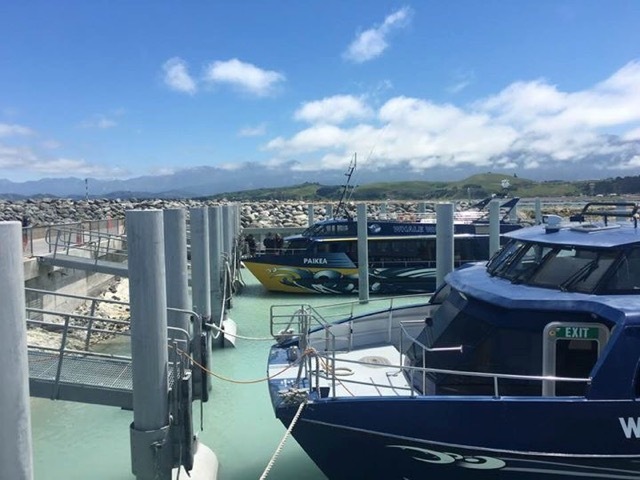 The new marina is an exciting development for Kaikoura – especially the jetty which will be used for cruise ship tenders. The first cruise ship scheduled to visit is the Seabourn Encore which will arrive on 15 December.